This week, Team USA’s Fab Five won a gold medal in gymnastics. If bicycle acrobatics was an Olympic sport, Darling Daughter may have had a gold medal, too. At 7:30 am, Daughter was en Route to her summer babysitting job. She traveled by bike. Had to be there by 8 a.m. Daughter hugged the side of the road, bike tires bumped between grass and curb…she wobbled along. Tried to save it. Then finally curbed it. Daughter (in her head): Oh sh#t…I’m going down. She flipped off the bike, but miraculously landed on her feet at the foot of the hill, helmet askew. Luckily Darling Daughter inherited my catlike reflexes and instinctively dove for the grass. Executed a graceful tuck and roll that somehow ended up part somersault, dive roll and front flip. Thanks to the helmet which absorbed any impact, her head was fine as it skimmed the grass. Blood streamed down the front of her leg from scrapes on her knee. The bike? A little banged up. She called me to pick her up. Except I don’t have a car right now. So Aunt Kate (Who IS here now AND living in a city nearby…) rushed over. Picked me up. And we hustled across town to peel Darling Daughter off the concrete. I handed Daughter band aids and Neosporin. We tossed the bike in the car and left the scene. Darling Daughter was super happy it was the first week of high school football practice. Meaning high school boys from every end of our small town either watched daughter ‘fly through the air with the greatest of ease’ or saw her perched on the side of the road waiting to be rescued. They couldn’t miss her. She wore a neon yellow shirt so that cars would SEE her. And not HIT her. NOT so that the town could witness her humiliation. 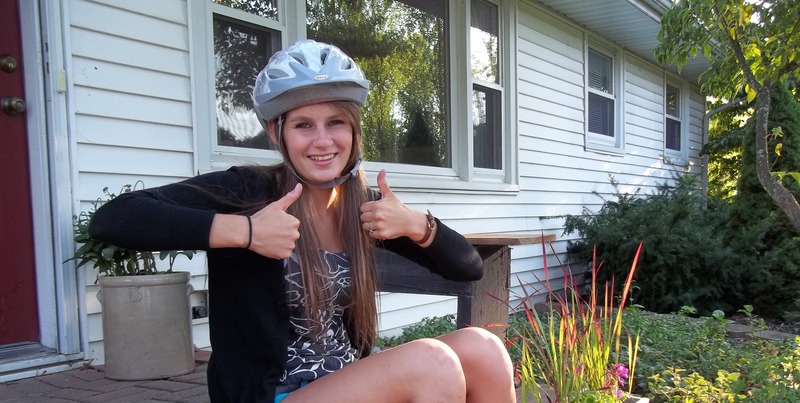 I never told Daughter to wear the bike helmet. But she knows where I stand on helmets. And she has seen me wear it. Ever heard that song by Queen? It’s my cell phone ringtone. I’m trying to embrace the bike since there are days it is my only transportation. Until I get a car. And I hope (and plan) to have a car soon. And I’m pro bike helmet. Firmly. Because the brain isn’t like an arm or leg. Doesn’t always heal when it gets banged up. Statistically, kids usually don’t get hurt riding bikes. Adults do. I’ve seen the effects of traumatic brain injury, and it doesn’t make sense to take the chance. Which is why I bought the helmet soon after I bought the road bikes this spring. Just for fun, I strapped it on and sat down in the dining room when I saw Daughter headed for our front door. She glanced my way as she entered the house. Daughter: What’s with the helmet? Me: It’s for when I ride the bike. Me: Know why? Because…I LOVE YOU. Me: If anybody can crash the bike, it’s me. Things tend to happen to me. And I don’t want you and Son stuck caring for a mother in a permanent vegetative state if I wreck the bike and bang my head. And though I was sitting in my dining room, wearing a helmet—I was actually quite serious. And so Daughter flounced back out the front door, headed to a bonfire with friends. But she relayed the story when she got there. Daughter: So I went home to change clothes….and my mom was wearing a helmet. Chapman: You got a helmet?!? I’ll just pretend I don’t know you. Me: Fine with me. I’m still wearing it. Though with my luck, I’ll fall off the dam# bike—and twist my knee, or some other stupid thing. I WANT TO RIDE MY BICYCLE; I WANT TO RIDE IT WHERE I LIKE. Maybe my ringtone STRETCHES the truth. I almost dropped my cell phone when Daughter told me where to pick her up. Because I nearly wrecked the bike in the same spot LAST month. I swerved to avoid a metal pole. Missed it by an inch, managed to stay off the pavement…AND on my feet. Thank you catlike reflexes!! What can I say? Like mother, like daughter? Even down to putting on the helmet.